After three years of negotiations, the University of Mary Washington Board of Visitors recently voted to transfer ownership of the Fort Germanna/Enchanted Castle site located along the Route 3 corridor in Orange County to the Germanna Foundation, according to foundation president Marc Wheat. UMW has held ownership of the prime property since 1990. Wheat said the Germanna Foundation’s predecessor organization tried unsuccessfully to acquire this same property in 1955. The Germanna Foundation will celebrate its 300th Jubilee of Germanna next year, marking the 1714 Germanna settlement. More than 30 years ago, world-renowned chief Jamestown archaeologist William Kelso conducted a survey at Germanna and found an intact ruin of probably one of the most elaborate mansions ever built in colonial Virginia, the “palatial” Enchanted Castle. The 62-acre tract of Fort Germanna – created by British-appointed Gov. 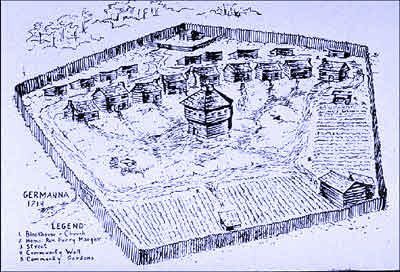 Alexander Spotswood in 1714 – included an “Enchanted Castle,” a town, ancient Native American sites, two prominent buildings thought to be a church and possibly a courthouse or jail, according to researchers. In December 2007, Kelso was back in the area and spoke to a crowd at Germanna Community College’s Daniel Technology Center, urging another dig at Germanna. Excavations in the 1980s and 90s involved UMW professors Douglas Sanford and Carter Hudgins. They uncovered additional remains of Fort Germanna. But by 1995, the research ended due to lack of funding.